We are accepting new patients. Contact our office with questions or to schedule an appointment. We accept most major medical plans. See our Billing page or contact us for more information. Are you or a loved one afflicted by debilitating pain resulting from neck and back pain, migraine headaches or virtually any other neurological disease? You don’t need to suffer any longer…treatment is available. The Neurological Center of Northern Virginia is the area’s premier pain treatment facility. Under the direction of expert medical director Dr. Sam Oraee, the professionals at the Center have been successfully caring for people with pain and neurological illnesses for more than 15 years. 2. A comprehensive approach, accurate diagnosis and patient-centered focus. 3. Compassion and concern for the dignity of each life affected by pain or a neurological illness. 4. Convenient hours and an accessible location, plus a newly renovated facility that offers the most state-of the-art equipment available. 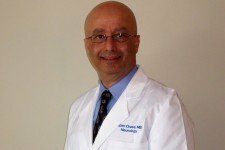 A leading specialist in the Northern Virginia area, Dr. Oraee is a highly saught doctor of Neurology and Pain Management with more than 23 years of experience treating patients with neurological issues and pain management.